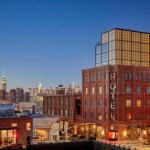 Housed in a converted 100-year old factory the 70-room Wythe Hotel is located on the Brooklyn waterfront. It's industrial character has been preserved and some rooms still showcase exposed brick walls. All rooms boast 13-foot high original timber ceilings windows and heated concrete floors. Some rooms offers a view of the New York City skyline while others offers guests a peek into the Brooklyn and Williamsburg neighbourhoods. The Reynard Restaurant and The Ides Bar are both gratuity free establishments. The Ides offers small plates while The Reynard serves breakfast lunch and dinner comprising of American eats. Locally sourced ingredients are used for the meals. A private dining room is also available. The North Williamsburg stop for the East River Ferry is 644 metres from the property. Music Hall of Williamsburg is 483 metres from the Wythe Hotel.